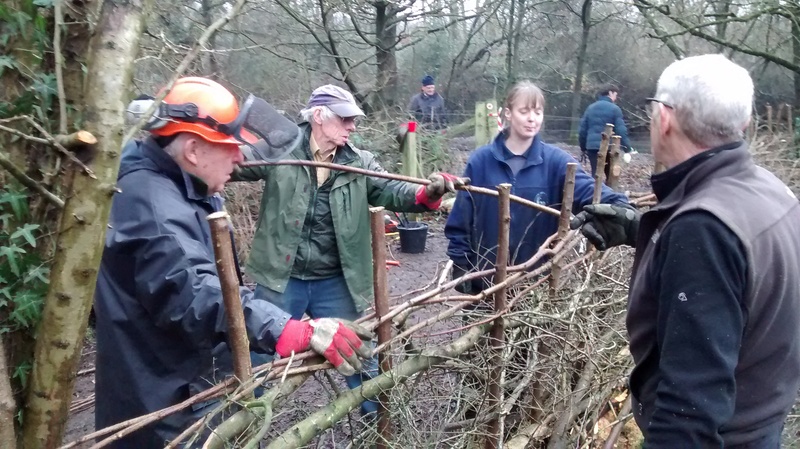 Yesterday the volunteers joined us at Moor Green Lakes for a spot of hedge-laying. The section of footpath and bridleway at the river end is narrow, so it’s great to open up access and create a living hedge. It turns out that Tony Elston laid the hedge originally around 15 years ago, so it was great that he could help up the second time. Firstly we pulled out bramble, whilst Mike pointed the hazel stakes that Charlotte and the volunteers had harvested from Gerry’s Copse last week. Next we started carefully pleaching the trees, by cutting the back with an axe so it can be folded (or flopped) over, to form a pleacher. It’s easy to cut off completely, but a tad trickier to leave a hinge so the pleacher stays alive so it can regrow. The left over peg of wood, or snot, is then sawn off to stop water collecting and rotting the stump. Since this hedge has been previously laid, we could still see some of the original 1st generation pleachers left in the hedge. Where these were too high, we cut away to lower them, as it’s better for the structure of the hedge to have regrowth at the bottom. Elsewhere the 1st gen. pleachers had sprouted, so we laid them to create 2nd gen. pleachers. All a bit tricky to juggle the different layers of delicate living trunks, but great to create a denser hedge which is better for wildlife. By lunch time we there were still some trunks to lay, so I had a go at precision chainsawing. 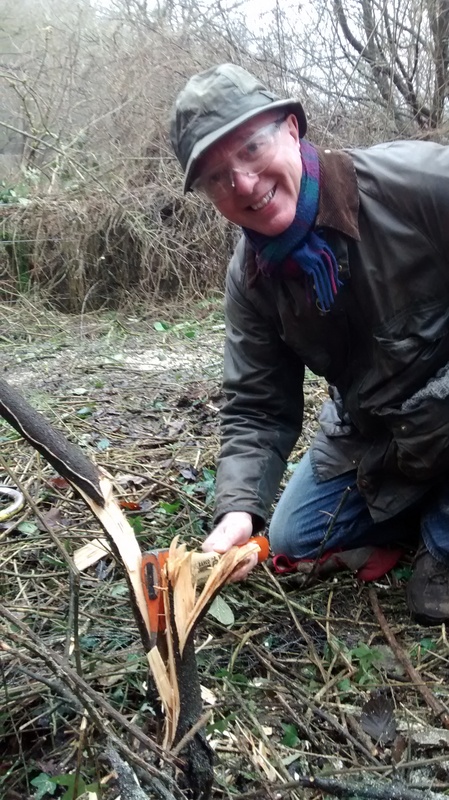 After lunch we were ready to tap in the hazel stakes with a mallet I cut from a nearby coppice. Then Jenny led the weaving of the hazel binders which give the hedge strength. The only things left were to trim up the hedge, knock the stakes in tight since the binders had put them under tension, and chainsaw off the tops of the posts, -oh and admire all our fantastic traditional skills laying 15m of living hedge. Thank you to everyone for all their hard work. 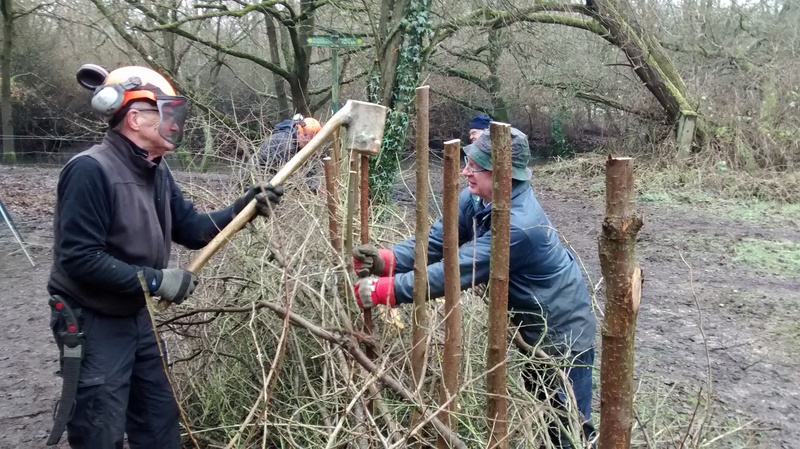 This entry was posted in Access, Conservation, Moor Green Lakes, Volunteers and tagged chainsaw, hedge laying, Moor Green Lakes, Tuesday Volunteers, Volunteers. Bookmark the permalink.